We all do it. We do it all the time no matter where we are. We watch – ever so subtly, so as to not to be spotted. But what happens when the art of people-watching is brought to the surface? What happens when a seemingly private moment is made public? As part of the Big West Festival, Tamara Saulwick has created a unique and insightful theatrical experience. Appropriately called Public, the show takes places in the food court of Highpoint Shopping Centre. 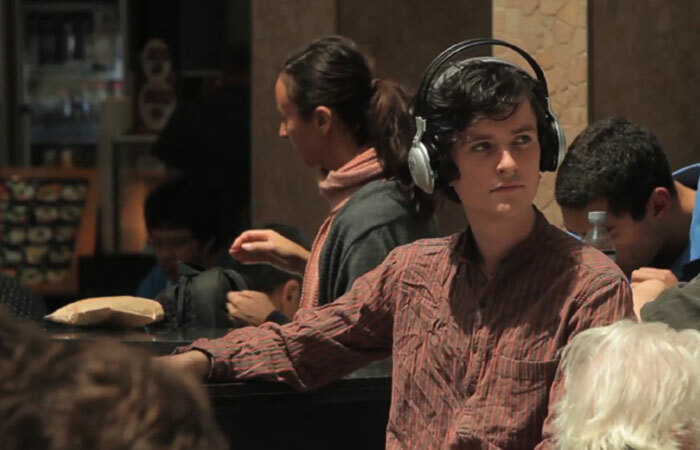 Provided with a pair of headphones, the twenty “audience members” disperse amongst the patrons of the food court and watch for the performance to begin. There are snippets of conversation being played out, and it sounds as if the voices are coming from all around you. And then, out of nowhere, I spot a man (Tom Davies) who doesn’t quite appear to belong. His movements are far slower and his gestures more grand than anyone else and I wonder why I hadn’t seen him earlier. Davies is joined by three others performers (Rachel Dyson-McGregor, Nicola Gunn, Diana Nguyen) and we begin to watch and listen as their conversations go from private to public. The performers’ conversations are played out into our headphones, so even though we are not sitting next to them, we can hear every word they are saying. There are a variety of performances and audiences occurring with Public. We are watching the actors, as are the non-audience members. We are also watching the non-audience members’ reactions to the actors and you can see them subtly trying to glance in their direction and then whisper to their friend about the “strange person” nearby. I also began to feel myself being watched by the non-audience members once they realized that we, the people with the headphones, were somehow involved with what was happening. It was interesting to unwittingly be “on show”, and without having the ability to communicate or share my experience with anyone whilst Public was occurring, I went through a range of emotions including sadness and a feeling of emptiness that slowly enveloped me. This does not mean I did not enjoy the show, but very much the opposite for allowing me to experience such thoughts and feelings without telling me what I should be feeling. Despite not being the easiest location to get to, Saulwick’s Public is definitely worth a trip out to Highpoint. This sort of innovative theatre does not happen often, and this is an intriguing and involving experience.